In MS CRM plugin, reading some configration setting/constant is a common requirement . Through Unsecure configuration we can easily achieve this. Add below configuration xml in unsecure configuration section of appropirate step in plugin registration tool. After writing the plugin and signing it, open Plugin registration tool. 1. Create connection either with Online or Office 365 Microsoft Dynamics CRM account. 2. 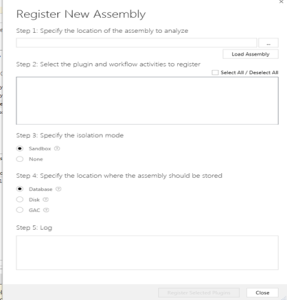 Register a new Assembly, when registering a plugin for Online Microsoft Dynamics CRM, Isolation mode has to be Sandbox and storage location has to be Database for Online plugin. a. Microsoft Dynamics CRM collects run-time statistics and monitors plug-ins and custom workflow activities that execute in the sandbox. If the sandbox worker process that hosts this custom code exceeds threshold CPU, memory, or handle limits or is otherwise unresponsive, that process will be killed by the platform. At that point any currently executing plug-in or custom workflow activity in that worker process will fail with exceptions. b. Sandboxed plugin is recommended when execution needs to be more secure, supports runtime monitoring and statistics reporting.